Yes! 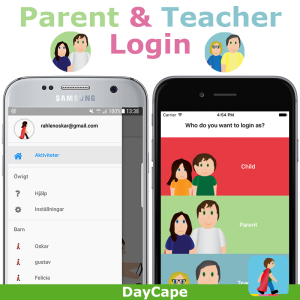 You can now login as a teacher, parent or child and plan the day directly in the DayCape app. We have been working extra hard to make the new DayCape version our best update so far. This version includes a new login function which allows you to log in either as a child, parent or teacher. This function offers new and improved ways to manage planning, directly from the app. With the help of user feedback, we have also been able to take care of several bugs. So now it’s even easier for you to enjoy your super day! Be even more mobile with the new DayCape! You can now log in as a CapePlanner and enjoy more ways to plan the day directly in the app. Add images directly from your phone or surf pad. Håkanson has developed an app and web platform that helps children navigate their days through a fun and interactive calendar.